Throughout the twentieth century and into the twenty-first, Northern’s students have unfolded stories from every corner of the globe. From its beginning in 1913, Northern students have told of the wonders of God’s work in countless ways. Joseph’s story is one of redemption. Currently a Northern student called to mission work in Asia, Joseph graduated in March of 2009 with an M.Div. 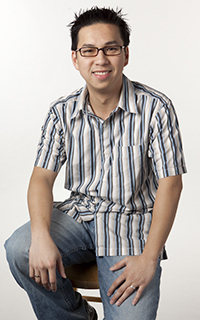 He serves as assistant pastor to Pastor Huu Nguyen at Vietnamese New Hope Church in Winfield, IL, where he works with youth 18 and under. Joseph has a burden for all Vietnamese and Vietnamese Americans – to draw close to the Lord and relate more with each other. A large gap exists between the youth and older generations in both the church and society. Grace Baptist in California sponsors and ministers to Vietnamese refugees. Here, they hear the good news, find homes, jobs and a new life in Christ. Joseph’s life verses come from Psalm 23. He truly lives in the knowledge that the Lord is his Shepherd, Protector, Provider and Teacher. He shared, “I don’t mind where I serve God, as long as I’m allowed to serve Him. I no longer live for myself, but I live to serve my God.” Northern students like Joseph have been following that call to serve Christ for a hundred years, and it has been a hundred years of faithful servanthood that creates Northern’s rich and inviting history.